How much power do Irish A1 and A2 riders generate? What about A3s and A4s and even Continental level full-time bike riders? 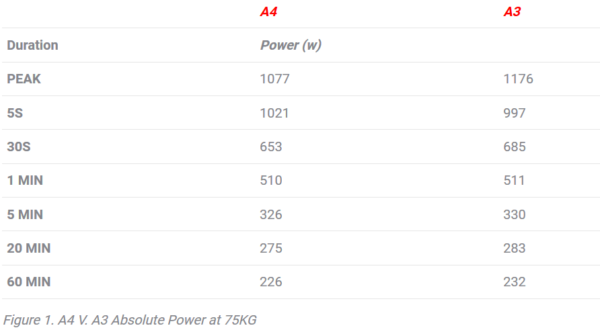 We take a look at the outputs and when and where the different ranks can produce most watts. Generating significant power, even significant power to weight, is not the only factor that separates the top cyclists for the rest. But it is important. It this piece we look at the power generated by cyclists – from A4 up to Continental level – coached by Premier Endurance. As a coach, a question I’m often asked is “how do I compare to….” or “what step up in power do I need to make to get to…”. Quite often athletes are very protective of their data. They think that revealing the information gives away their competitive edge. This leads to inflated or deflated numbers being discussed around the tea and sandwiches after a race. Before we dive into some charts and data, it’s important to say these numbers are only part of your picture as a bike rider. 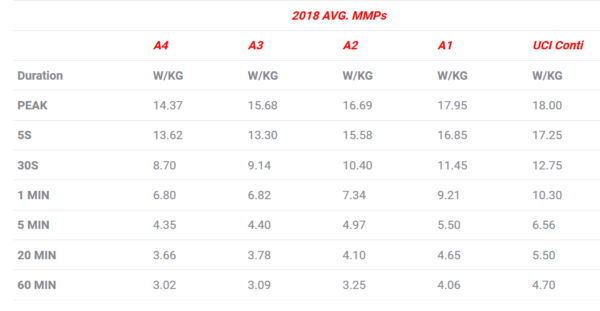 As you can see we have taken each of the common power durations from peak right up to 60 minute average power and expressed them in W/Kg – a relative metric expressing power in terms of weight. So, to find your absolute value simply multiply your weight by the figures above. Regarding the data set; we’ve taken four riders in each category that we currently work with here at Premier Endurance. And we use their numbers as a basis for comparison. These peaks were set in 2018. Interestingly power durations from ‘peak’ to ‘one minute’ were often set in training, most likely due to freshness. In racing we’re setting these powers under fatigue after hours of racing and these durations are often your race winning effort. As we go up the categories we usually see more of a potential to produce these maximum efforts under fatigue (in racing). And the capacity to repeat them over time increases. Five, 20 and 60 minute powers were set in racing; often at the start or middle of a race to get into breakaways and push on from a group. You could add more and more metrics to this chart and expand on it countless times over. But for now we’ll look at the basics. From the A4 to A3 comparison we do not see much of an increase. Interestingly the ‘five second’ average is higher in the A4 data set. If we take a 75-kilo rider, we can see the absolute outputs below in figure 1. These are all jumps made (relatively) easily with specific training and greater racing exposure. It is after this that we see a steady increase in power outputs as we move through the categories. Something that caught my eye was the difference between the A2 and A1 categories. Given these athletes compete together, it does highlight the merit of separate A2 races for riders who have just been recently upgraded. This would give them a stepping stone into this domain. The difference between A1 and UCI Continental becomes apparent when we move from ‘one minute’ upwards. The ability to sustain extremely high-power outputs is quite often due to greater training load, increased recovery and more exposure to racing; cycling is a Continental rider’s full-time job after all. It is around here that riders begin to specialise in one power duration. So you will often see outliers to the norm here. As always, more data would mean a higher quality data set. I’m also aware of the lack of female data here and it is something that could be built upon. If U23/elite riders and/or coaches want to send expressions of interest to info@premierendurance.ie we can work to build this resource. It would only prove to be beneficial to coaches and athletes alike. I will make the spreadsheet – along with some more detailed analysis – open access on my website http://premierendurance.ie/ and update frequently.